In this free CCNP GNS3 lab we are going to use a simple GNS3 topology to demonstrate how to add host PC workstations and server to a GNS3 lab. There are three possible techniques to add a PC workstation or server to your lab. 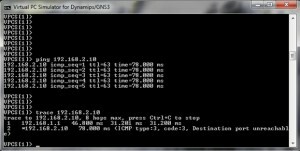 If you just want to check connectivity using ping or traceroute, the simplest method is to use the Virtual PC Simulator (VPCS). 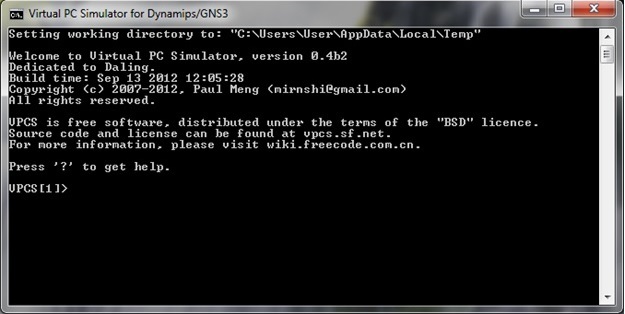 The second method is to use a Qemu or VirtualBox guest (Qemu and VirtualBox support are integrated into GNS3). Third method is to use a router and to configure it to act like a PC. In this article we are only going to cover using a router to act as a PC and VPCS. The method of using Qeme or VirtualBox involves much more configuration and an advanced understanding of GNS3. If all you need is to check connectivity within your topology, I highly recommend using VPCS. The Virtual PC Simulator is a free application and available to download from the GNS3 website. 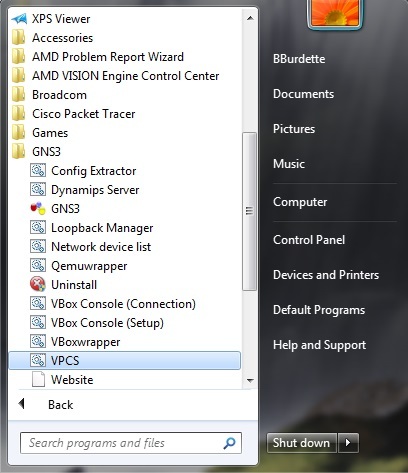 The Virtual PC Simulator is a application that operates within Windows or Linux. It has limited functionality, but most important, it allows the use of pings and traceroutes. These are the most common testing commands used in your training labs and are usually the only commands necessary. Using VPCS you will save memory and processing power. Before you can use the host in you lab you need to start the VPCS application. 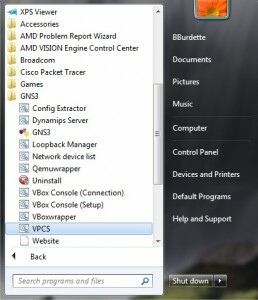 To do this, go to the Windows START MENU and select the VPCS application in the GNS3 folder of Programs. 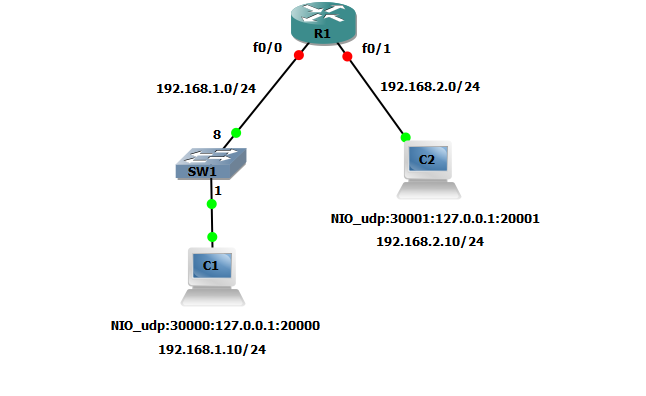 The following diagram shows how these interfaces would be used in a simple GNS3 lab. Note: the NIO_udp:30000:127.0.0.1:20000 and NIO_udp:30001:127.0.0.1:20001 labels in the diagram. This is the interface of the attached device. Now we need to assign and IP address, subnet and default gate way to our devices. This is done in the VPCS window the syntax is “ip [IP address] [default gateway address] [subnet mask]” To move between host devices just type the number of the host and press enter. Once our Host PCs have an IP address, and router has been configured. 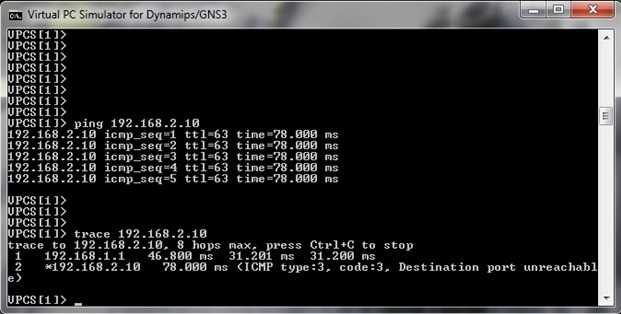 We are now ready to test our connectivity using the ping and trace commands from within VPCS.. I hope you have found this informative and will use VPCS in your future labs I know I will. Thanks Barry, this was very helpful.